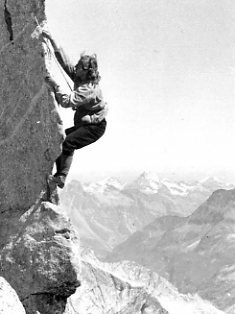 My grandmother, Mary Hingley, climbing in the Swiss Alps some time in the 1930s. She died yesterday at 91. She was one of those fearless, indomitable grandmothers who appear only in children’s books. In addition to being a serious mountaineer (she was the first woman to do some of the most difficult climbs in the Alps), she was a great horsewoman. One of my favorite stories about her tells how she was trying to ride a particularly wicked horse (appropriately named “Chance”) which bolted and tried to throw her off. She had a grip of iron, though, and finally the horse gave up, threw itself down on the ground, and rolled on her. She broke four ribs and a collarbone, and as she was being wheeled into surgery one of the nurses said something like “well, Mrs. Hingley, I don’t suppose you’ll be riding again.” “Nonsense! Of course I will!” she rumbled. There are probably not too many grannies who rumble, but she did. She had a stentorian voice, which my daughter appears to have inherited; when she called from England, she would address the telephone like a sailor hailing the shore in a gale — you could hear her voice coming through the phone receiver clearly from the next room. She was a very kind person. I have a tape from when I was 9 years old, interviewing her during one of her visits to Canada. I sounded sort of like Gavin from Kids in the Hall, but I love her tone of grave attention, the way she enters into a child’s fantasy of doing a radio interview. Sorry about your grandmother, Phil. The taped interview was lovely. I’m sorry to hear about your loss. It’s nice that you have the tape. Photos are nice, but hearing a voice is special.